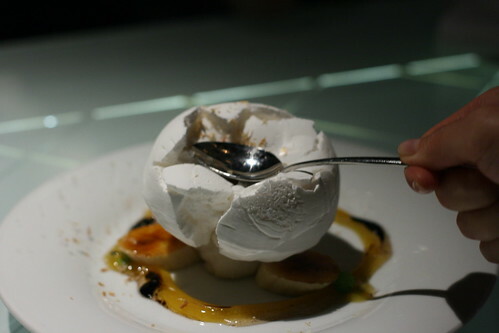 If you’re dining in Los Angeles, you need to read My Last Bite. Jo knows all the best restaurants in the area. That’s how I knew about The Bazaar at Jose Andres 465 South La Cienega Boulevard, Los Angeles, CA 90048, which was the highlight of the Southern California portion of our trip. 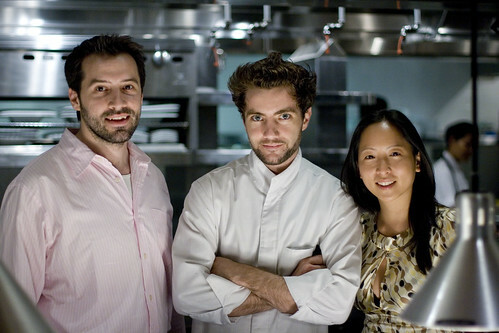 It offered the complete LA experience, starting with a brief chat with the sous chef, Marcel Vigneron, of Top Chef Season Two. We asked him to choose our dishes for us, which was a good move because every single dish was special. Our waiter recommended a cocktail made with muddled green grapes. 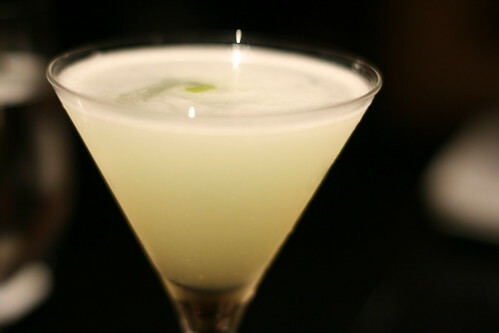 It was light and refreshing, tart and sweet, but balanced so that it was neither too tart or too sweet. 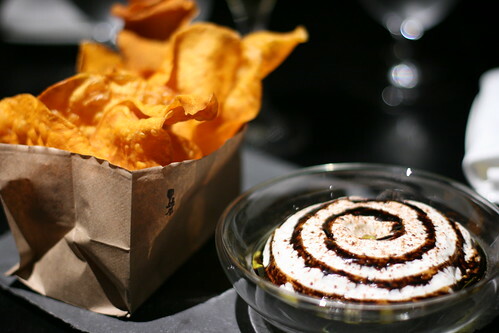 The Sweet Potato Chips came with a mesmerizing bowl of fluffy yogurt spiraled with tamarind. The airy lightness was a welcomed change from heavy dips. The funky style was so suitable for the modern wonderland around us. It was a great snack that needed a few more chips to finish the amount of dip served. 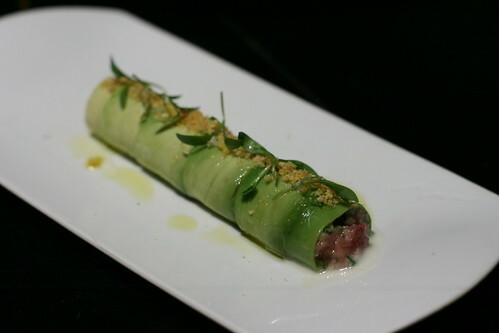 Next a tuna tartare wrapped in a delicate ribbon of avocado, perhaps the first time I really enjoyed avocado. The flavors melted together on your tongue, the subtle touches of sea and garden. 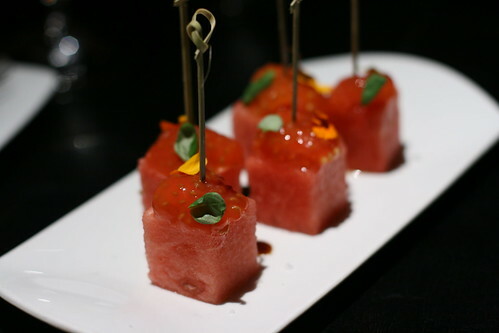 Cubes of fresh watermelon with tomato innards on top was clean and refreshing, feeling more like a palate cleanser. The Caprese Salad was no ordinary tomato and mozzarella salad. 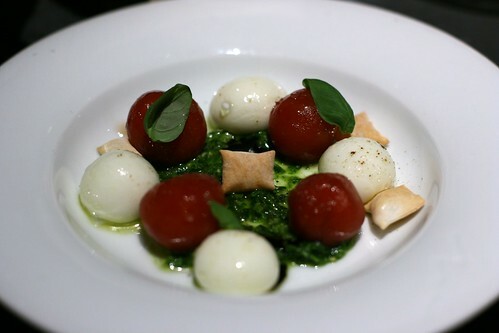 What looks like bocconcini are actually spheres of liquid mozzarella. We think the tomato was actually pressed tomato meat, formed into a ball, so that there would be no seeds, just concentrated tomato flavor. We were advised to eat it all with a spoon, with the pesto and little puffed crouton, I opened my mouth as wide as I could and enjoyed the familiar combination in a whole new way. 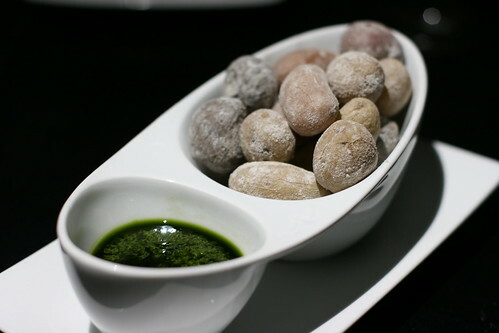 In discussing the next dish, our best guess was that these bite sized potatoes were baked in a salt crust. After submerging one of the salty potatoes in the accompanying Mojo Verde, I popped one after the other. Herbalicious and salty, tender hot centers, going from individual potato to crushed potato in your mouth effortlessly, with a gentle pop of the skin. 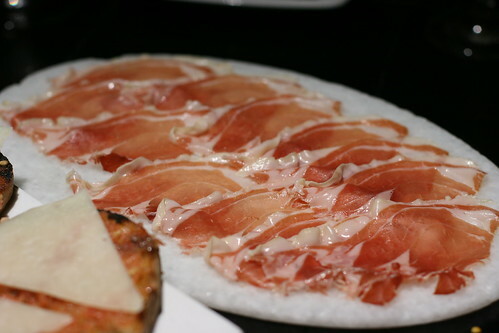 We’ve had Jamon Iberico several times before. This is the first time I noticed a faint sweet nuttiness, perhaps from feeding on acorns. Served at room temperature, the fat melts on your tongue, sensual but reserved. 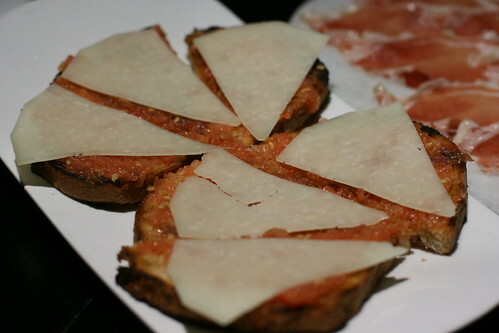 The Jamon is served with some toasts, spread with tomato and topped with a smooth mild Manchego, drizzled with fruity olive oil. It’s so simple but the perfect match. It’s suggested that you could put the jamon on top but I like eating alternating bites between the jamon and the toasts. 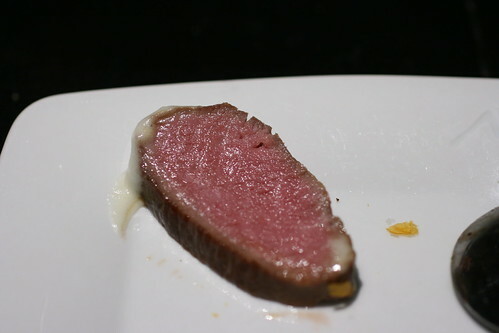 The sous vide lamb loin shows off the perfectly even cooking. 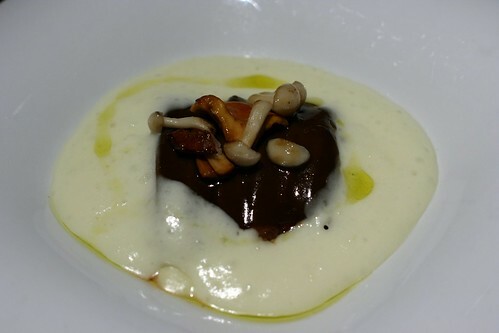 It was served with a coating of gelee, topped with mushrooms, and potato foam, another inventive take on familiar flavors. The baby corn was incredible, charred on the outside, making it taste like popcorn. The corn and huitlacoche purees were perfect sauces for it, adding salty and sweet, with a little bit of funk. 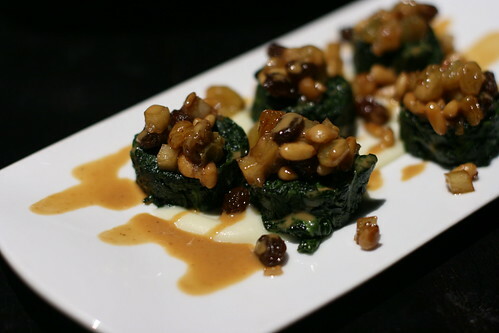 The clusters of spinach topped with pine nuts and raisins, and an apple reduction was another surprise of concentrated flavors in perfect harmony. The toasty nuts, plumped raisins, and juiciness did not hide the spinach. Comfortably full, we were escorted to the dessert area, a different section where you can see the showcase of desserts to chose from. 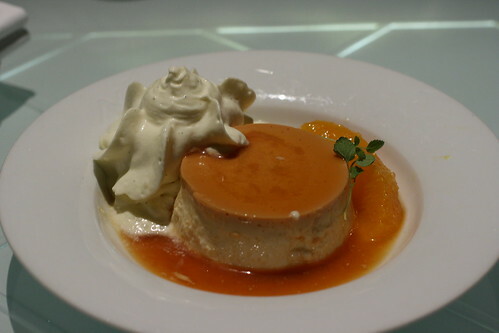 Here, we had a nice creamy flan. 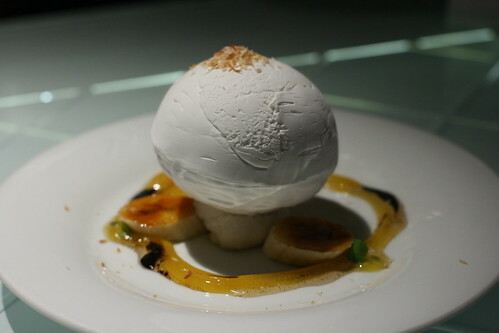 The Coconut foam frozen with liquid nitrogen, called something like Floating Island was light and airy, matched with glazed bananas. You are told to break it with a spoon. We found the coffee and chocolates to be unimpressive, the only things we would advise against, as everything else was notably delicious. By now, we noticed that sitting at the table next to us was Katy Perry, Eliza Dushku, Perez Hilton, and we weren’t sure if one of them was Ashley Tisdale. Despite the impressive celebrity sighting, Lon and I were much more taken with Marcel. We always comment while watching Top Chef, that we wish we could taste the food. During season two, it seemed at times, Marcel took inventiveness a bit too far and allowed dramatics and presentation to take over taste. If that was the case, he has certainly grown without letting go of presentation and creativity. 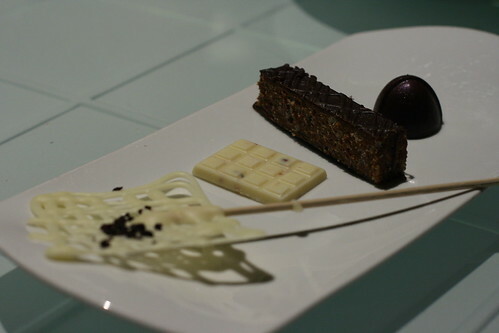 As beautiful and surprising as each plate is, it is just as memorable for the flavor and balance, even some familiarity. It seems that food in Los Angeles is a bit cheaper than in New York, but we still thought that $233.37 for 4 people was a great price for the experience (with tip, roughly $70 per person). Service was excellent until we got to the dessert side where it noticeably fell off. Still, I’d go back in a heartbeat and I wish I could. posted by jessica	at 12:38 PM	Filed under Celebrities, Cocktails and Liquor, Drinks, Fusion or Mixed, Restaurants, Travel. You can follow any responses to this entry through the RSS 2.0 feed. Both comments and pings are currently closed. Beautiful photos. I haven’t had the baby corn yet, so I must go back soon! LOVE Marcel’s creativity. I’m surprised how many vegetarian dishes you had, that’s a plus for me. Is Eliza D. stunning in person? what a great photo with Marcel and that “Wolverine” do! Wonder if he took Michaal Voltaggio’s spot. We’ve yet to try Bazaar, except for a food festival event so will have to try it. Oh! Everything look so attractive, gorgeous! Yummie! Wow–what a great meal! I love the coconut foam shots. Kasi, I don’t know…the same as on TV I guess. Ravenouscouple, Marcel knows how to pose for the camera! Cool photos! Some of these dishes look sooo good! marcel! golly, that was a good season of top chef. what happened? Spectacular meal! And you got to talk to Marcel – how cool! 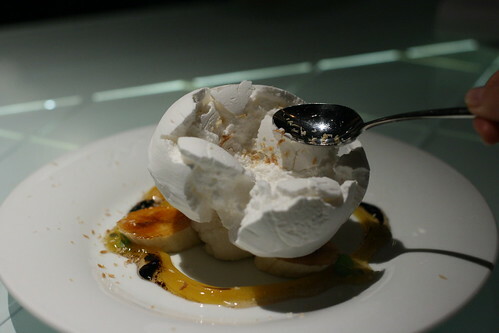 I need to visit Jose Andres restaurants in DC, I can’t believe I’ve never been yet! What a gorgeous array of food! I’ll bet those flavors cannot be beat! Plus celebrity sightings? What fun! 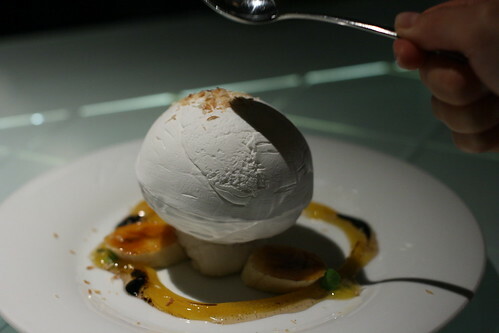 Oh, that looks fabulous – especially the coconut dessert! I probably will never get to eat something like that (they don’t make food like that in Georgia, to my knowledge) so it was nice to see all the photos. great pics! the funny story is that my husband and I were at the table next to you (also took pics)…and while we had food recommendations, we chose some of our dishes after seeing yours arrive! Megan, this meal fit LA very well. I bet Georgia has their own specialties we don’t have, and it’s actually on our list of places we want to eat! Alison, no way!! Did you love it as much as we did? Feel free to link to your pics! So it’s worth going to, huh? I may be in Los Angeles in a few weeks, and was debating whether to make a foray to the Bazaar. Good to know you guys give it the thumbs up. Carolyn, we highly recommend it! Can’t wait to hear what dishes you eat! Lo de mostrar ilusiÃ³n en el trabajo y transmitirla, es algo que estÃ¡ al alcance de muy pocos. Yo, generalmente, me conformarÃ­a con que cada uno hiciera bien su trabajo. Si lo demÃ¡s viene por aÃ±adidura, albricias.